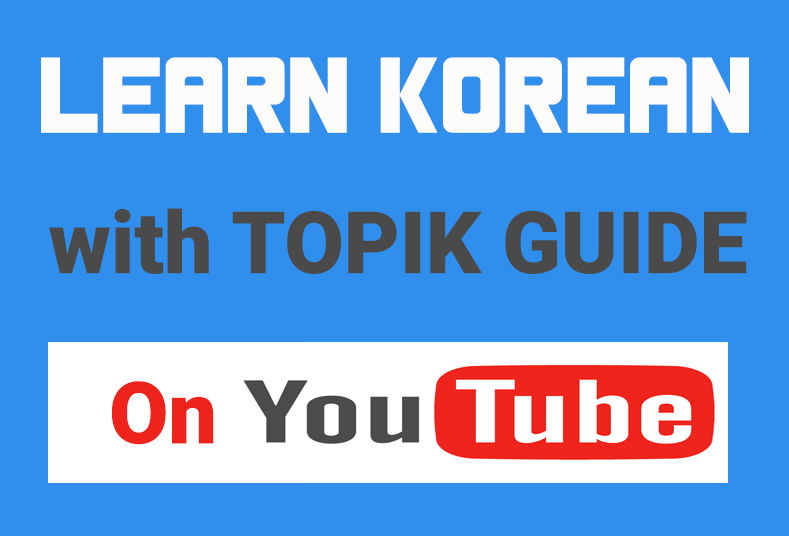 In this post, we are publishing a list of the most basic and important Korean vocabulary for TOPIK I (Beginner Level). You can also check the Complete TOPIK Grammar List – Beginner Level (한국어능력시험 초급 기출 문법 리스트). If you are going to take the TOPIK Test for the first time, or if you want to give your score a boost so that you can pass a higher level, we would strongly advise you to get the Complete Guide to TOPIK – Self-Study Package. It is a digital study package that has everything you need to get a great score in the TOPIK test – all the past TOPIK papers with answer sheets, grammar and vocabulary study material, video tutorials explaining the test structure, strategies to solve them and much more. You can check out more details about this study package HERE. ex) 나무가 부러져서 길이 막혔어요. We hope this list help you with your TOPIK preparation. Feel Free to ask If you need help with any of these words. All the Best from TOPIK GUIDE! Thanks, your blog is wonderful. Can I use this for TOPIK 3 test? where can I learn to pass the TOPIK lv. 3 test? Does 너 무 means “Too” ?? I think it means “too much/excessively”…is not it?? yes, it means “very, too, too much, excessively”.. depending on the context.. Thank you so much for posting all of these words. It’s a great review! Is it all for topik beginner? I cant belive! I was expecting more.. Check out http://www.learnkoreanwords.com/ for 1500+ Korean Words for TOPIK Beginner. Is this the COMPLETE list of vocabulary that is needed for the Beginner Level TOPIK? Thank you for pointing out the mistakes.. The list was sent by a reader and I couldn’t check it thoroughly..
the list covers only Grammar-Vocabulary (어휘-문법) section of TOPIK and not all the four sections… words were collected from a total of 17 TOPIK tests administered during 2003 to 2010 ..
I’m using a flashcard app to study the vocabulary for Beginner Level TOPIK and I’m wondering if it’s better to learn them all in alphabetical order or to shuffle the cards? I’m finding it difficult to learn all of the ‘기역’ words one after another as the similar sounding ones start to get jumbled up in my head. Any advice or is it just a matter of personal preference? from what i found in dictionary it means ‘warm’, doesn’t it? I would like to join Korean language class. I am working in company in south korea near masan city. where did I join Korean language class on sunday ? Hi all, I have just come across this site, so a very late response. I have noticed some spelling errors and format errors. Would it be better to email my feedback or list them all here? I love these lists and thank you to all the participants. It would be great if you could send them through mail. Hi all! I have just found this site and it is amazing. Thank you to all who have contributed. I have started Korean language classes, and being a not-so-young English speaking person, this is a real challenge. It is often the little things you hear along the way that make the difference. I have found some formatting problems and english spelling errors. How would you like me to pass these on for reference? I appreciate that you have uploaded this for us but I need to tell you there are mistakes on translation / meanings image lucky because my boyfriend is Korean and I am living in Korea so I could ask someone who is native and use nave dictionary . But for someone that doesn’t have any Korean friend they can question it or ask for examples I think its a bit worrying. I not saying bad I really appreciate your website and your guide. But this needs to be checked again please so others don’t think it means something but it actually mean a different thing for example on the verb 넣다 means to put submit add include it can be use on sentence like I put something on my pocket but in the meaning stated by you its saying pour and it doesn’t even come close to the meaning. Also 내리다 is drop but it’s more used as come down or get off they use a lot I’m going to get off bus now. 겆다 is to have to hold to own something not take. 구경하다 is sightseeing it can be use only for when you are watching a view or the city it Can’t be use to stated I’m watching TV. 길이 막히다 is kinda blocking the pathway but Koreans only use for traffic jam. I haven’t study all vocabulary given here so I don’t know if it has more or not. So that why I’m asking you to review this list. Dear Fátima, your valuable feedback is much appreciated. Thank you!! Your grammar made me feel dizzy !!! have all the typo is been corrected?